18/24MO - $33.99 Only 1 left! The difference between being a "little devil" and a "lil devil" is slight, but oh-so-important. Let us explain. Being a little devil means doing evil things, like poking people with a trident or one's spiky tail. It means sticking your grimy hand in the cookie jar when mom's not looking and spitting up on her brand new sundress. It means banishing your enemies to the fiery underworld and inciting upsetting acts with others, like knocking over every glass of water you can with your other little buddies or crying incessantly on four-hour flights. Being a lil' devil, in stark contrast, means being adorable. That's it. It's almost a parody of the former, dressing the part and acting the opposite. 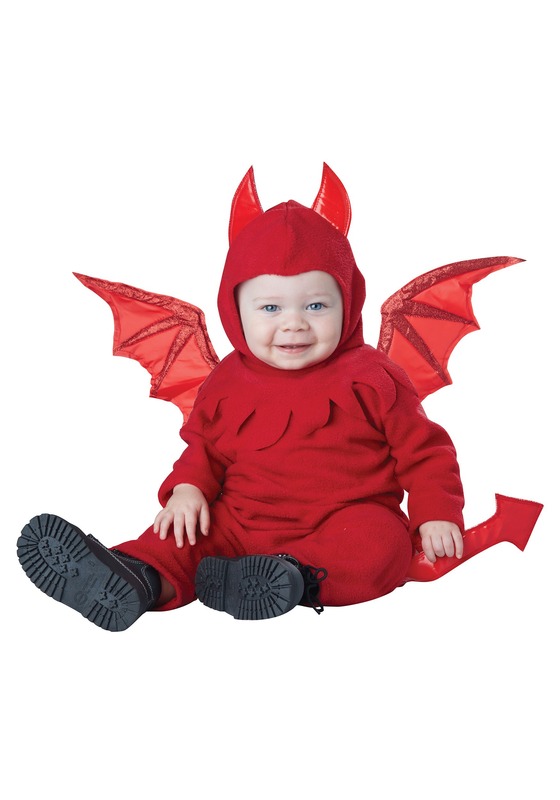 Your little cutie can do just that while wearing this Lil Devil Costume for toddlers and infants. It's 100% polyester for his or her comfort, and features Velcro at back and inseam snaps for easy diaper access for your sanity. It even goes the extra devilish mile with glitter foam wings and a faux leather tail. Instead of inspiring anger and annoyance over spilled milk, this costume will only have your friends dying to have one of their own. But not literally.